The Duchess of Maine, to whom the title of this disc refers, was Louise Bénédicte de Bourbon, granddaughter of Louis II de Bourbon, Prince of Condé, a French general known as 'le Grand Condé'. In 1692 she was forced to marry the Duke of Maine, legitimised son of Louis XIV and Mme de Montespan. Probably in order to ease her unhappiness the Duke purchased the Château de Sceaux, close to Paris and today one of its suburbs. Here the Duchess celebrated her passion for science and the arts, organising parties, especially at night time. Between 31 July 1714 and 15 May 1715 so-called Grandes Nuits took place. As she was rather short she chose the honeybee as her emblem and created the Order of the Honey Bee in 1703. It was composed of 40 members, just like the Académie Française, with the Duchess as its queen. Its ceremonies lasted until the 1730s. 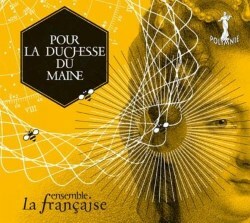 The present disc includes two cantatas and an instrumental work by three composers who were in one way or another connected to the Duchess of Maine. However, as Catherine Cessac states in her liner-notes, these pieces were not specifically written for her. Nicolas Bernier dedicated his fifth book of chamber cantatas to the Duchess, as the title indicates: Les nuits de Sceaux, but his cantata Médée is from his fourth book. Bernier is one of the lesser-known French composers from the first half of the 18th century. He was educated at the keyboard and studied with Antonio Caldara in Rome. He was mainly active as maître de musique in several churches, from 1704 to 1726 at the Sainte-Chapelle in Paris, as successor to Marc-Antoine Charpentier. His œuvre includes a large number of motets, both petits motets - for solo voices and basso continuo - and grands motets, for solo voices, choir and orchestra. He also composed a set of Leçons de ténèbres. However, he was also one of the most prolific composers of chamber cantatas, a genre which bears witness to the growing Italian influence in France since the early 1700s. Bernier's cantatas reflect that influence in that they comprise sequences of recitatives and dacapo arias. Thomas-Louis Bourgeois was born in Hainault, which today is a province of Belgium. Between 1700 and 1705 he was active as a church musician in Toul and Strasbourg, then went to Paris to sing as an haute-contre in the Académie Royale de Musique. He also gave music lessons and composed two ballet operas. In 1721 he was in charge of the Théâtre de la Monnaie in Brussels. He was forced to leave because of financial mismanagement, and went to The Hague, where he headed the French theatre. From 1728 to 1735 he sang at the music academy of Dijon, which was founded by Jean-Philippe Rameau's brother Claude. As the academy closed down he returned to Paris where he again composed music for the theatre. Bourgeois was also a productive composer of chamber cantatas: his oeuvre, a considerable part of which has been lost, includes 33 such pieces. He follows the same model as Bernier. The inclusion of cantatas about two tragic women from classical antiquity makes much sense. It is known that the Duchess had a preference for tragedies, and Ariadne and Medea must have appealed to her, because of her unease about her forced marriage. Many operas and cantatas were written about these two women; one of them was Charpentier's opera Médée. On a much smaller scale Bernier impressively explores the tragic story of this woman. The soprano alternately takes the role of narrator and of Medea herself. After a short instrumental introduction she sings a dramatic recitative, which also includes a part for an instrument, here played on the violin. This recitative, and the ensuing aria, are characterised by agitation, which is reflected in the vocal part as well as the instrumental accompaniment, again with a violin. The next aria, with the indication tendrement, is quite different, and here the instrumental part is played on the transverse flute. Bourgeois' cantata Ariane opens with a recitative, whose first line - "On a ghastly rock against which the rogue wave breaks with fury" - is illustrated in the music. In the first aria the soprano is accompanied by violin and basso continuo; its content is depicted by rapid repeated notes in the violin and the cello. The second aria opens with the words "A thousand bursting trumpets carry his [Bacchus'] glory in the air". Bourgeois takes this as an opportunity to make the soprano and the two instruments imitate the sound of trumpets. This, and Bernier's cantata, end with a short aria which includes the moral of the story. In between we hear a Concert de chambre by Jean-Joseph Mouret. Whereas the other two composers did write music for the Duchess, they were never formally employed by her. That was different with Mouret: in 1708 he entered the service of her husband, as the music teacher of his children. By the time the Grandes Nuits started he acted as Ordinaire de la musique de la duchesse du Maine. Mouret was mainly known for his stage works. His melodic gifts earned him the posthumous title of musicien des grâces. He also left a number of cantatas, but his œuvre includes little instrumental music. It comprises of a set of six sonatas for two transverse flutes and two concerts de chambre in two and three parts, consisting of an overture and a series of dances. The first of these is included here. The penultimate movement is called tambourins, also often included in operas of the time. The piece ends, almost inevitably, with a chaconne, by far the longest movement, lasting just over 7:30. The Ensemble La Française was founded in 2013 by graduates from the conservatoires in Lyon and Brussels. This is their first disc and it is a direct hit. In fact, this is by far the best disc with French cantatas that I have heard in recent years. Marie Remandet is simply brilliant in her portraying of the two tragic characters in the respective cantatas. The dramatic features come off to the full, and are realised in an exemplary manner. Articulation, diction, dynamic shading and ornamentation are impeccable. Ms Remandet shows that a maximum of expression can be achieved without an incessive vibrato. She uses it as it was intended at the time: an ornament at the right time and place. The playing of the instruments is of the same level: the performers put the sequence of events and the way the composers have translated them in their music in the centre. Shiho Ono's violin plays a substantial part in the most dramatic moments of the cantatas. The cooperation between the soprano and the instruments is excellent. The ensemble also delivers an outstanding performance of Mouret's Concert de chambre. There are only two issues. Firstly, it is regrettable that the performers did not use historical pronunciation. Secondly, I would have preferred a somewhat more intimate acoustic. There is a little too much reverberation here and there. However, in no way these issues compromise my appreciation of this disc. It is a joy to listen to and I am sure that I will return to it. The fact that the ensemble decided to record music by three composers who are little known is a further argument for this disc. It is also one of the reasons to label this disc Recording of the Month, and to add it to my shortlist of Recordings of the Year.